Henderson, Kentucky’s newest place to hang out is quickly becoming a favorite lunch spot! What’s the best way to enjoy downtown’s newest place to chill? Grab some southern food from one of these local carry-out restaurants while relaxing at The Perch on Second Street! Henderson has a variety of carry-out restaurants that are all full of deliciousness. From barbecue to burgers, check out some of Henderson’s favorite carry-out stops. To see all of Henderson’s local eateries, check out the link below! When you visit John Earl’s, you are greeted with smiling faces and savory scents. The walk-up service window is a gem in a world of drive-throughs and drive-ins. John Earl’s offers a wide menu selection, and accepts call-in orders as well as walk-up orders. You can visit them at 733 Martin Luther King Blvd. The 2017 winner of Henderson’s Best All-Around Fast Food & Best All-Around Restaurant, The Dairette Grill is a local favorite. Fried green tomatoes, cheeseburgers, and ice cream are among some of the highest reviewed menu selections. It is located at 711 Atkinson St. and accepts call-in and drive-through orders. Patio seating is also available here, too! Yum-Yum Chinese Restaurant is the lunch time hot-spot for your Chinese food craving. Offering all of the classics, there is no wrong choice! Will you pick General’s Tso’s chicken, sweet and sour, or sesame? Located at 241 S. Green St., Yum-Yum welcomes call-in, fax, and drive-through orders. 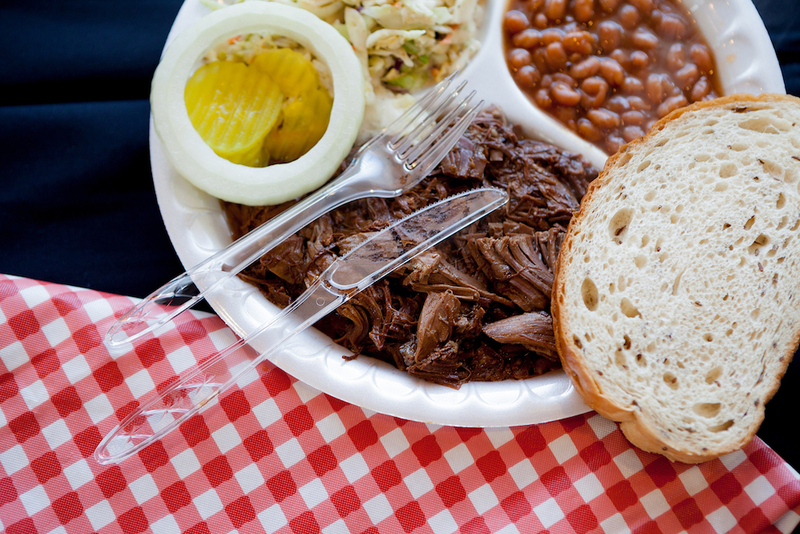 Fresh smoked barbecue is never a bad choice, and home-cooked fixings are the perfect complement to it! Tom’s Market offers just that, and more. Walk-in and call-in orders are welcome at their new downtown location, 223 Second St., right across from the new pocket park, The Perch! When is the last time you went to an old-school drive-in? Home of Colonel Jim’s Spicy Chicken, Mr. D’s Drive-In offers chicken, hamburgers, and a variety of sandwiches and desserts. It is located at 1435 South Green St. and accepts call-in orders as well as drive-in orders. You can’t miss this spot, just look for the giant chicken statue! Henderson’s unique railroad bridge sees dozens of trains a day; see the trains go by while you pick up your lunch order from the Whistle Stope Cafe! Located at 227 N. Main St. (within A Day To Remember Flowers), The Whistle Stop Cafe offers daily lunch specials and desserts. This dining spot is the middle of downtown activity, and within walking distance from The Perch! They are open from 10:30 a.m. to 3:30 p.m. Monday through Friday. Eat local in Henderson! Check out this list of all local restaurants.